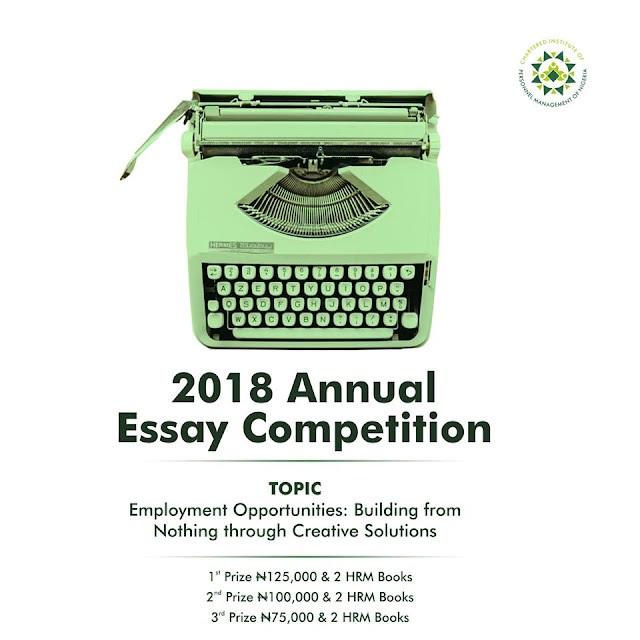 The Chartered Institute of Personnel Management of Nigeria announces her 2018 Annual Essay Competition. The essay, which is ONLY for Nigerian Undergraduates, must be original, empirical and of local and international journal standard. Times New Roman and 12 points font type and size are not negotiable. The length of the essay must not exceed 3000 words with proper referencing using the APA style of referencing. All entries should be typed in double line spacing, using MS word ONLY. Plagiarism in all forms is prohibited and will attract outright disqualification of indicted entries. For further enquiries or information: Email: essaycompetition@cipmnigeria.org.